The Smithsonian's National Air and Space Museum has launched a Kickstarter campaign to preserve Neil Armstrong's spacesuit. The suit, worn during the 1969 moonwalk, will degrade unless tended to. That's one small donation for man, one giant stretch goal for mankind: today, the Smithsonian Institute launched a Kickstarter campaign to preserve the space suit worn by Neil Armstrong in the legendary 1969 walk on the moon. Is this the Kickstarter campaign of the century? The campaign's launch marks the 46th anniversary of a human being setting foot on the lunar surface, at about 8:18 UTC on July 20th, 1969. The museum hopes to have the display up in time for the 50th anniversary. Armstrong, who passed away in 2012, was wearing this suit when he gingerly stepped down the lunar lander's ladder, and uttered the immediately famous words: "That's one small step for a man, one giant leap for mankind." The NASA mission ended the ongoing space race, and the United States remains the only country to have landed people on the moon. It is the first in a series of Kickstarter-Smithsonian collaborations to raise money for future exhibits. The Smithsonian hopes that incorporating the public into its projects will raise interest in science and history, especially among those who otherwise wouldn't have a chance to contribute to research and preserveration. 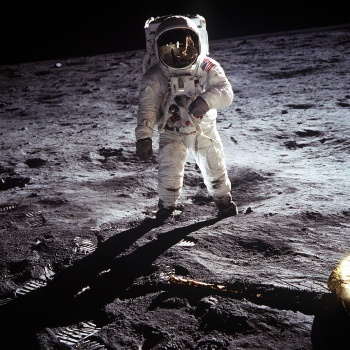 The spacesuit was never built to last: it was durable enough for a trip to the moon and back, but it is built our of materials that will eventually degrade. It hasn't been on display since 2006. Apart from preserving the suit itself, the Kickstarter campaign's budget will go towards 3D scanning the suit to produce an online model, and building a custom mannequin that will wear the suit in its state-of-the-art display case. Stretch goals have not been announced, but other Kickstarter campaigns suggest that if they double their goal backers will receive additional miniatures, beta access, and a downloadable NPC designed by Buzz Aldrin. As of this article being published, the campaign has reached just under 20% of their goal.